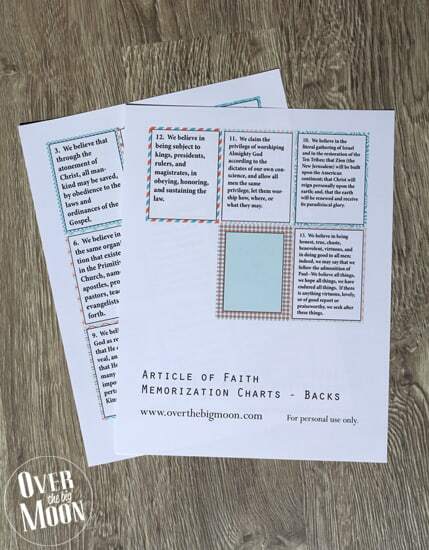 A few months ago I put together these fun Articles of Faith Memorization Printable Cards for my Activity Days Girls! I’ve since been called to teach primary to the kids that are turning 8 and we’ve been using them in class too! 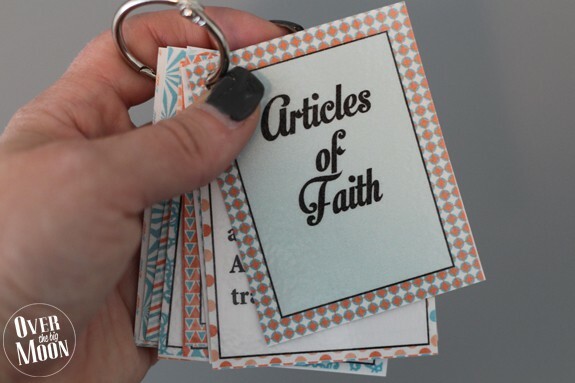 Such a fun way to help the kids become more familiar with the Articles of Faith! There are two downloads below – one for the fronts of the cards and one for the backs of the cards. Each download is a 2 page download. So, when you print the document you’ll print your page front and back. That way the cards are two sided! After I print the pages I ran them through my affordable home laminator! Then I cut the cards out! You could cut the cards first and place them individually into the laminating sheets and then cut all around them too. Which ever way you prefer! After I had them all cut, I punched a hole in the upper corner of the cards. Make sure you have the same side of the cards facing forward when you punch the holes! Otherwise they won’t all go on the ring right. Lastly, put them all on a ring! That way your kids can easily grab them off their night stand to practice or to take them to church to practice during Sacrament Meeting! In order to print a complete set of the Articles of Faith cards, you’ll need to download both links below! One of for the fronts of the cards and one is for the backs! 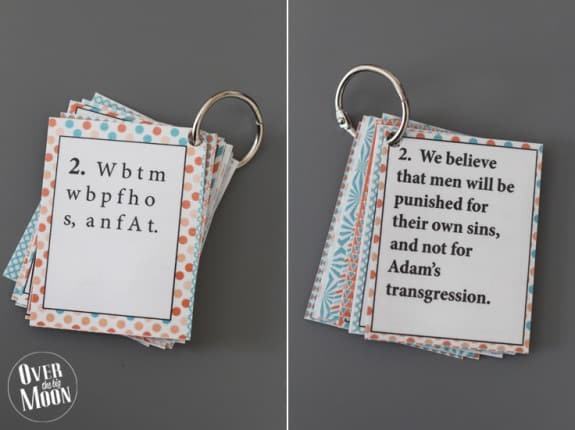 I hope these come in handy can help your kids learn their Articles of Faith! Have a great weekend! I love this and would love to do it for my Activity Day girls, but looks like the links don’t work anymore. Is their a way to still get them? Thanks! there are a couple of errors with the letter symbols page not matching the Articles Of Faith first letters. Have these been corrected? Won’t the lamination come off if you laminate them before cutting them apart? The links aren’t working. Is there another way to download them? They are so cute! The links aren’t working to print these. Hi, I am wanting to print these off for my son’s 8th birthday but it is not allowing me to download. It gives me a 404 warning. Any tips? Thanks, I printed these out for my 11 year old Primary class. I love the clue side with initials of the words! I’m so glad you love them! My husband uses them in his class too! These are super cute! Thank you for making them. I am so excited to use them with my kids as we help my oldest get ready to be baptized. When I printed them today I found four with errors. I just wanted to let you know but also was curious if you have an editable version. I am happy to fix them I just didn’t want to recreate the wheel if you already have the file. The errors are #2-on the back there is an h for their instead of a t, #7- says fit instead of gift, #8- need to take out “in” after we believe, should just be we believe the…, #11-on back missing the last two letters t m. Thank you again for making these! I love them! Thanks so much, I will work on getting those fixed! Since I wrote the last comment we also noticed that #13 is missing the last phrase on the front side. We have loved these though! They have been an amazing help with my whole family learning the articles of faith. Thank you! will be able to edited? The link is not working….. Very nice. Love the looks of them. I too am getting a 404 page not found message. I get an Error message when I try to click on the downloads. I am excited to print these for my kids. I will check back later. Thanks! Super cute!! Thanks for sharing! I’ll definitely be printing these off for my sons to practice. (On #7 it looks like it says ‘fit’ instead of ‘gift’, just wanted to let you know.) Thanks!